Twelve years ago I started a book — An Eco Manifesto — which was going to reveal the many overlaps between green and libertarian values, between ecology and free market economics. I got nearly 50,000 words written before I admitted to myself that I didn’t have the time to get these ideas polished enough to be publishable. So I decided to go for a web site instead: holisticpolitics.org. Ironically, to this day I still haven’t posted most of the ideas in that original book. There are only two eco chapters here and one of the is rather weak. Instead, I have focused on equality and morality. My New Year’s resolution for 2013 is to put lay off on my other projects (here and here) and finally get around to adding the environmental chapters to this site. I have quite a bit of unposted material on shrinking sprawl, sustainable economics, and cutting back on the consumerism. Somewhere in my notes I have ideas on noise pollution as well. Most of the ideas require less government than we have today. In the years since I’ve come up with a few more green chapters, including one on population and another on Eco-Conservatism. But before I get to rewriting and posting this material, it’s time for a bit of a makeover. I started this site targeting New Agers, hippies and progressives — a demographic that seemed pretty large back when I was in Asheville, NC (think Portlandia East). Now that I’m back in the real world, I’m ready to back off of the groovy look — many have objected to it over the years. 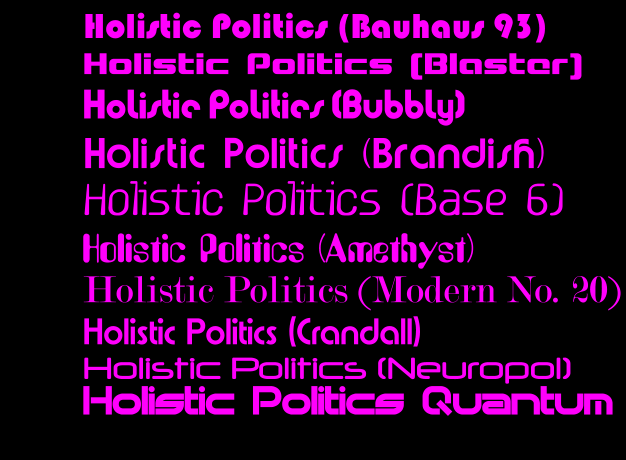 For the holistic chapters, I have gone from a hippie font to an old school computer font. The idea is to go for a retro-futuristic look. Back when I was young such fonts were used for future-oriented books. I may change this. My wife says the font is hard to read. I might go for Bauhaus 93 (as seen on the right) as an alternative. What think ye? I’m toying with going with Village for the liberty/gold button chapters. The Prisoner was a libertarian masterpiece. An alternative would be Bernahard Fashion, which looks like the title text on some Ayn Rand novels. While appropriate given that they’re actually coming out with movies of Atlas Shrugged, I hesitate to associate liberty too tightly with Objectivism. I had an Old English font for the liberty chapters to evoke the Constitution and Declaration of Independence. But now I’m thinking of using this font for the morality chapters — it reminds me of the high church Episcopal Church of my childhood. I think I’ll keep the hippie font I had for the green chapters. The good news is that I have today written a button generator in C#, so I can trivially change the size and font of the buttons — which was not the case when I relied on Adobe Illustrator (which does not run on my new computer to boot). I will soon be able to quickly generate banners as well, as long as I stick to 2D fonts. For 3D I either need to learn a newer API or edit individual Xara files. I’m game to do the latter after locking down the fonts, but I don’t want to have to re-edit them while playing with fonts. So, any feedback you might have would be appreciated on the sooner side. See the main site as well as the alternative fonts shown in this post. The Modern No. 20 reminds me of some science textbooks and maybe patents. Amethyst is what I have now (as of Jan. 6). The others are kind of sci-fi. For the Left, I have the options of either looking like old Soviet propaganda or a typewriter font (for liberal media). Not shown in this pic, but shown as a candidate for liberty, is Village. The Village was based on Jeremy Bentham’s ideally regulated society, complete with panopticon.